The Fortnite Week 9 Challenges are out, with one of them requiring you search chests in Haunted Hills. This guide to all chest locations in Haunted Hills will help you get this week 9 challenge completed as easily as possible. For more info on Fortnite Week 9 Challenges, head over to our Fortnite week 9 challenges guide page, where you'll get an overview of the challenges and links for more detailed guides. One of the week 9 challenges in Fortnite is to 'Search Chests in Haunted Hills'. This requires you to search seven chests in the Haunted Hills region of the Fortnite Battle Royale map. This can be done over numerous games, but you do have to complete a match for the chests searched to be counted. In order to complete the 'Search Chests in Haunted Hills Week 9 challenge in Fortnite you're going to have to find the chests. 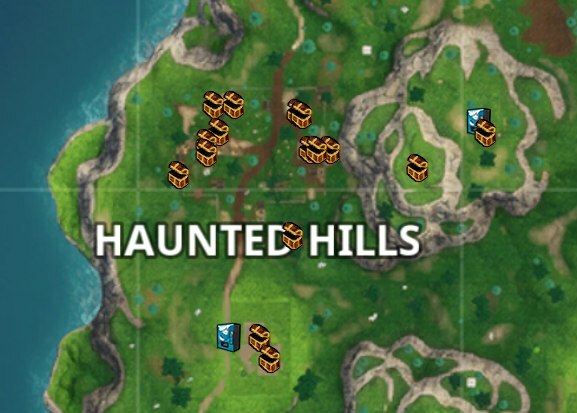 There are plenty around in Haunted Hills, but just in case you're struggling to find them we've got a complete Haunted Hills Chest Location map for you just below - thanks to the excellent Fortnite Chests site. That's all you need to know to compelte the Search Chests in Haunted Hills Fortntie Week 9 challenge, but make sure to continue ahead to our Fortnite skins page where we’ll rank the best outfits available in the game, or out Fortnite Mobile guide if you want to know how to download and play the game on the go.